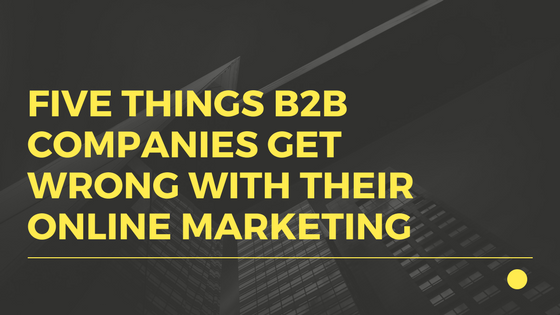 Does it seem like B2B companies are always playing catchup when it comes to online marketing? That’s probably because they are. The process of marketing in the digital age has become increasingly complex. Many B2B organizations are still using outdated tools, struggling with inadequate resources, or getting so caught up in the latest tech that they forget the basics. Here are five common mistakes we see B2B companies making when they market online. Why is it so hard to connect with fresh prospects online when you are selling a technical, engineering, manufacturing, or industrial product? Because you think that they are already prepped to hear about the specs when their minds and hearts are still far away. B2B companies often rush to talk about the benefits (or even the features) of their product before establishing emotional rapport. That’s an understandable mistake since the target audience is often knowledgeable and educated. But generating excitement and connecting on a personal level is a step that can’t be skipped. This is particularly important for online ads, when buyers are first being introduced to a brand. Intrigue is the name of the game at this stage. Be human, be compelling, grab attention and don’t let go. According to a 2015 study by Autopilot, “Marketers using automation software generate 2X the number of leads than those using blast email software.” Replacing manual processes with automated systems is about more than saving labor hours. Leveraging automation tools opens your eyes to a whole new set of strategies and tactics for creating successful campaigns. It’s also beneficial for lead nurturing and boosting revenue from existing clients with cross-selling and upselling as new products and services become available. This is probably the biggest challenge that B2B companies face. Sales knows it. Marketing knows it. They just haven’t figured out what to do about it. Sales and Marketing must collaborate to create a set of buyer personas, agree on what a qualified lead looks like, and decide what analytics tools and metrics will be used to track results over time. In combination with automation, this targeted approach delivers better quality leads to Sales and allows Marketing to demonstrate its true value as a partner in improving the company’s bottom line. The Content Marketing Institute revealed in 2015 that “55% of B2B marketers say they are unclear on what content marketing success or effectiveness looks like.” Obviously, that goes back to the discussion that Marketing and Sales should be having about lead generation and cultivation. But there is no question that content marketing does get eyeballs on your brand. According to Hubspot, B2B companies that publish 11+ blogs a month received almost 3 times the traffic of those blogging 0-1 times per month. Of course, you can also see a benefit with a modest amount of blogging—particularly if you take the time to create real thought leadership pieces. Finding the right balance of volume, consistency, distribution platforms, and content types (video, podcasts, blogs, etc.) will take some time. Don’t be afraid to start small and build your strategy along the way as you see what types of content get the best response. The 2015 B2B Buyer’s Survey Report discovered that B2B buyers are 60% of the way through their decision-making process before they engage a sales rep. They are judging the quality and credibility of your brand right now based on the look and feel, navigation, eye-catching design, and content on your company website. If they don’t like what they see, your business may be eliminated in the early rounds before your sales team even gets the chance to make a pitch. That doesn’t mean you need to add a bunch of bells and whistles to your website. Often, it means streamlining the functionality, ensuring mobile compatibility, revamping the messaging to put the focus on the customer and their concerns, and delivering a visually compelling experience that draws people in. Visit your competitors’ websites and do a side-by-side comparison. If you aren’t blowing them out of the water, it’s time to step up your game. For more ideas on ways to improve your online marketing, contact Web Revelation today. We’re happy to help!